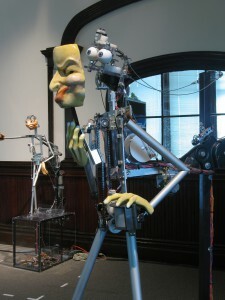 This installation consists of three robotic puppets that are electronically linked through a behavioural program that allows them to interact with the viewer. 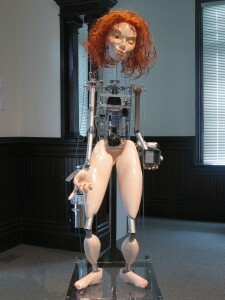 It was conceived and created in collaboration with robotic artist Jessica Field. 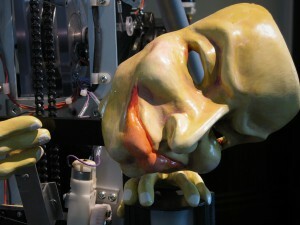 Each puppet character is programmed with the ‘desire’ for ‘life’ which can only be attained through viewer interaction. 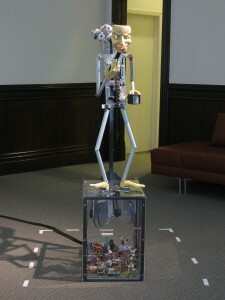 The viewer acts as the catalyst for each character to fulfil its desire. 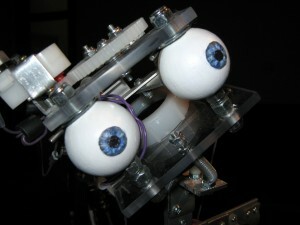 Each puppet holds a motion sensor which is triggered by the motion of the viewer. The puppets are electronically linked though a behavioural program that causes each puppet to “compete” for the attention of the viewer. 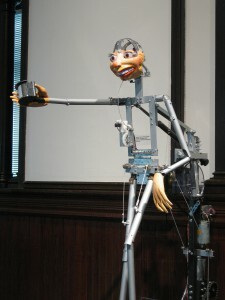 The puppets are programmed with specific rules of conduct that are based on the characters ideal way of attaining and maintaining motion – which is manifested through their physical and behavioural character traits. They are also programmed to measure success and failure based on the length of time that the viewer moves infront of them, and on how much attention (movement) the other puppets are receiving. Viewer interaction dictates the patterns of motion creating a spontaneous narrative that emerges between the three characters. The narrative reveals a complex social interaction between characters who compete for the viewers attention. When the puppets are successful in attaining motion, their desire is fulfilled and their behaviour reflects their success. Conversely, when they are unsuccessful they experience a conflict with their ideology. The viewer is at once the audience and the puppeteer causing the puppets to become dependent on the viewer both for motion and subjectivity. The possibility of loosing the attention of the viewer to another puppet, forces them to obsessively measure their success and failure based on their rules of conduct. Their existence is dependent on their ability to compete within the social structure that is created out of their desires, causing them to remain trapped in an ongoing narrative, ever dependent on an external force (the viewer) to fullfil their desire. Plays the the role of the seductive stereotype, enticing her audience with a sensual dance; undulating her hips, tilting her head, pursing her lips and calling the viewer closer with a flick of her wrist and swing of her arm. CORDELLIA Offers a spastic, almost frantic dance to keep the viewers attention. She adopts the archetype of the fool, in the hopes that she will keep the views attention though humor and foolish behaviour. Has adopted a mysterious yet playful artifice to entice the viewers curiosity, and hopes to keep their attention by keeping them wondering what she might do next.